Canine Cushing’s Disease is also known as hyperadrenocorticism and is a relatively common but serious condition that typically affects middle-aged or elderly dogs. Sometimes mistaken for the natural aging process, the symptoms of this disease are often vague at first, but become more severe with time. If left untreated, this condition and its symptoms can seriously detract from your pet’s quality of life. Hyperadrenocorticism can manifest itself through a multitude of different symptoms. Generally, several of these symptoms will occur in combination. One of the most common signs of Canine Cushing’s Disease is hair loss, which often occurs symmetrically and evenly, and can affect a large surface area. Dull, dry fur and slow regrowth are other changes that can occur with respect to your pet’s coat. Many dogs also experience thinning, wrinkling, or darkening of their skin, which results from changes in the epidermis that include a loss of elastin. Three other frequently occurring symptoms are polydipsia, polyphagia, and polyuria. Respectively, these terms refer to significantly increased thirst, increased hunger, and excessive urination. If your house-trained pet begins to have uncharacteristic urinary accidents in the house, this could be a sign that your dog is experiencing polyuria and, in turn, could be a symptom of Cushing’s Disease. In addition to these most common warning signs, there are several others to look out for as well. These include lethargy, weakness, and trembling muscles, especially in the hind legs. This can also lead to reluctance to exercise or jump in a way previously characteristic of your pet. Dogs with this condition also tend to pant excessively and often seek out cool places where they can rest. An afflicted dog may appear to lose weight, which could be due to a loss of muscle mass. Furthermore, many canines develop a sagging, potbelly and a bony appearance to their head. 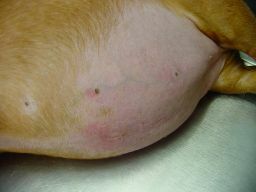 Sometimes hard lumps will appear on the body of a dog suffering from this condition. These lumps are caused by deposits of calcium in the skin and subcutaneous tissues. Any of these above symptoms, especially in combination, could be a telltale sign that your dog is suffering from hyperadrenocorticism. Diagnosing Canine Cushing’s Disease is not always easy and a series of tests carried out over a number of days may be required. Certain routine blood tests may suggest the possibility of Cushing’s Disease through the presence of elevated levels of certain liver enzymes, blood glucose, and neutrophils, a type of white blood cell. Other white blood cells, namely lymphocytes and esinophils, may decrease in number. Also, a urinalysis may reveal diluted urine as well as abnormally high protein levels. Furthermore, an x-ray or ultrasound may show an enlargement of the patient’s liver or changes to the adrenals. However, while these more general tests can raise hyperadrenocorticism as a probable cause for your pet’s suffering, specific testing is often required in order to confirm this suspicion. One of the most commonly employed tests in attempts to confirm a diagnosis of this condition is the ACTH Stimulation Test. For this type of test, a primary blood sample is taken in order to determine the levels of cortisol in your pet’s blood. Next, the veterinarian gives the canine patient an injection of cortisol stimulating hormone (ACTH). As its description implies, this hormone stimulates the production of cortisol in the patient’s body. One hour after this injection, a secondary blood sample is collected. A dog suffering from Cushing’s Disease will show an excessive amount of cortisol present in this second sample. If an ACTH Stimulation test is not enough to make a concrete diagnosis, a low dose dexamethasone (LDD) test can also be performed. For this procedure a baseline blood sample is drawn to note the levels of cortisol, followed by an injection of the steroid dexamethasone. Follow-up blood samples are then taken several hours later. As the injection of dexamethasone is meant to suppress the production of cortisol, a dog without Cushing’s Disease will produce less cortisol while a dog that is suffering from this condition will continue to produce the substance. Often these tests are most helpful when used in conjunction with other examination procedures such as ultrasound. Although having this type of testing done can be costly, it is a vital first step in determining a treatment plan for your canine companion and will help you to improve your pet’s quality of life. If your dog is suffering from canine Cushing’s Disease, it helps to understand what exactly this disease is all about. Basically, this condition is an endocrine disorder that involves the over-production of cortisol by the adrenal glands. Cortisol is a necessary hormone that plays numerous roles with respect to blood sugar, fat metabolism, the nervous system, and many other aspects of the body; however, too much cortisol can cause some serious problems. In a healthy canine, the hypothalamus instructs the pituitary gland to release adrenocorticotrophic hormone (ACTH), which then travels through the bloodstream and triggers the production of cortisol by the adrenal glands. When the necessary amount of cortisol is present in the blood, the adrenal glands stop producing or produce less of the hormone. When cortisol levels drop, more cortisol is produced. As result, a healthy canine body maintains minimally fluctuating levels of cortisol. A dog suffering from Cushing’s Disease, however, experiences chronic over-production of cortisol, which then effectively poisons the dog’s system, causing numerous problems. There are three main causes of Cushing’s Disease, one of which is medical treatment. This results in what is known as Iatrogenic Cushing’s Disease, which arises when a dog receives large daily doses of cortisol over a long period of time in order to treat some other medical condition such as allergies. Dogs are particularly susceptible to this type of hyperadrenocorticism, more so than cats. Fortunately, this form of the condition can be completely reversed simply by slowly reducing and removing the external source of cortisol. Another cause of this disease is the presence of an adrenal gland tumor. These types of tumors result in adrenal-based hyperadrenocorticism and are responsible for approximately fifteen percent of the spontaneous, or non-iatrogenic, cases of this condition. Fifty percent of adrenal gland tumors tend to be benign while the other half are malignant. The presence of such a tumor disrupts the communication between the adrenal glands and the pituitary gland. The result of this is that the adrenals continue to produce cortisol despite any messages to the contrary that the pituitary gland might be sending. Thus, the healthy balance of this hormone is disrupted and high levels of it enter the bloodstream. The most common cause of canine Cushing’s Disease, however, is a pituitary gland tumor. In fact, eighty-five percent of the cases of this disease result from this type of tumor. When caused in this fashion, the disease is referred to as pituitary-dependent hyperadrenocorticism. In such cases, the pituitary gland produces excessive amounts of ACTH which, in turn, over stimulates the production of cortisol by the adrenal glands. Again, communication is disrupted and the pituitary continues to secrete the adrenocorticotrophic hormone despite what the adrenal glands are signaling it to do. Dogs who suffer from pituitary-dependent hyperadrenocorticism tend to have significantly enlarged adrenal glands, as they are continuously overworking to keep up with cortisol production as directed by the pituitary gland. If it turns out that your beloved pet is indeed suffering from hyperadrenocorticism there are a number of different treatment options available that can help to improve your companion’s quality of life. As suggested earlier, Iatrogenic Cushing’s Disease is the easiest form of the condition to treat, as the external source of the steroid simply needs to be withdrawn. Tumor-based cases of this disease, however, are more difficult to manage. There are certain pharmaceuticals available, such as mitotane, that can help to reduce the severity of the symptoms caused by this condition. In addition, some dogs respond well to surgery or chemotherapy treatments. On the other hand, if you are interested in more natural ways of treating your dog’s symptoms, there are also several options available. One homeopathic remedy used in this regard is known as homeopathic pituitary and is administered in low doses over an extended period of time. The use of this substance needs to be carefully monitored, but it is known to help regulate the actions of the pituitary gland, reducing the detrimental effects of the disease. Homeopathic formic acid is another natural remedy which is especially effective during the early stages of Cushing’s Disease. Doses with a potency of 6x administered over one to two months have been known to effectively improve the health of an afflicted dog’s coat, as well as the animal’s over all health. A number of other herbs such as garlic, rosehips, wormwood, and milk thistle can also provide relief for your canine companion when properly administered and carefully monitored. Homeopathic remedies in general tend to be especially effective when Cushing’s Disease is caught during its early stages. However, no matter what type of treatment you wish to pursue, a qualified veterinarian should always be consulted first. Also, since elderly dogs are the ones most commonly affected by this condition, there are often other health issues in addition to the hyperadrenocorticism that need to be taken into account. Your pet’s comfort is the most important thing and treatment options will need to be tailored to suit the specific, individual needs of your dog. You can’t prevent spontaneous Cushing’s syndrome, but with early treatment, you may prevent potential complications. treatment for spontaneous Cushing’s syndrome includes medication to reduce blood cortisol levels (mitotane and ketoconazole) or to improve mind neurotransmitter balance (selegiline), or surgical treatment to remove the adrenal glands, that are located close to the kidneys. Your veterinarian will treat iatrogenic sickness by slowly reducing your dog’s steroid treatment. Adrenal Harmony Gold works to normalize the production of adrenal gland hormones and alleviates suffering from Cushing's in Dogs.